CONSIDERING THE amount of time and space dedicated to straight pool in this issue, let�s take another look at the discipline. While most amateurs play 8-ball and 9-ball, straight pool can be a new and interesting way to practice skills needed in every game. Here are two of the most basic and important characteristics of top-level straight pool � and a quick introduction into practicing 14.1. Short position play: Unlike 9-ball and 10-ball, you won�t be faced with too many shots where you have to go four rails from one side of the table to the other for your next shot. That being said, unlike those rotation games, you will quickly discover that a matter of an inch or two can turn a perfect shot into a perfect disaster. Similar to 8-ball, planning a proper route through a rack is absolutely essential. With 15 balls able to go in all six pockets, you have options. But it�s always surprising to realize how things can become limited very quickly. You have to deal with obstacles, clusters and problem balls, so keeping complete control of your cue ball is a must. Also, when you work your way to the break ball, one misplaced cue ball can lead to big problems. Planning a pattern: And just like 8-ball, formulating a feasible strategy is the only way to succeed. The best players in the world can overcome a lack of planning with expert shot-making and cue-ball control. But you�re only going to bail yourself out so many times. 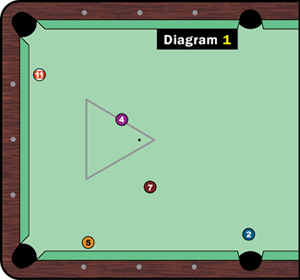 Identify possible break balls and work backward, as if it was a game of 8-ball. In Diagram 1, the 7 is a natural ball to use for your break shot. Knowing this, you can start looking for a key ball, one that�ll let you get perfect shape on the 7. The 2, an ultra-easy shot in the side, is one option. So if you can clear the other three with decent shape on the 2, you are on your way to 14.1 success.